I am enjoying a mug of hot cocoa as I write this, with an afghan and cat on my lap. Mouse and my husband are building a house out of Lego. Earlier, Mouse and I were making ice cream sundaes out of play-doh, as her doll taste tested each of our creations. How are you spending your Sunday? Did you have a good week? What I Am Reading: I had less reading time than I had hoped this week unfortunately. I finished Tawni O'Dell's Angels Burning early in the week and also read my TBR List book that had won January's poll, What She Knew by Gilly Macmillan. Both were rather intense thrillers, offering glimpses into the darker side of humanity. I hope to have reviews for both of those up before the month is out. I have since moved on to Jennifer Robson's Moonlight Over Paris, a historical fiction novel about a young aristocratic woman from London who moves to Paris is search of independence and adventure during the 1920's. I thought maybe something a bit less dark would be a good change of pace. What I Am Watching: My husband and I began watching Dark Matter on Netflix this past week. It is a science fiction show about a group of people who wake up on a spaceship with no memory of who they are or what's happened to them. I admit the Firefly comparisons came almost immediately for us, but we both are enjoying the show. We are still watching Doctor Who, of course, having now officially moved from one companion to the next. Mouse took it much better than I thought she would--I was the one who still couldn't help but tear up. What's Going On Off the Blog: Our Christmas tree is still up. My daughter asked, or rather begged, if we could keep it up again this year like we did last year. She remembers decorating it for Valentine's Day and St. Patrick's Day and for her birthday too. It's quickly becoming a family tradition. At least the cats will enjoy it too. To celebrate my husband receiving a job offer after being out of work for the past few months, we took advantage of our Disneyland annual passes and spent a day at Disneyland. The weather was perfect--sunny and cool. We had a fun time. At first Mouse was quite disappointed we weren't spending the day at one of the local malls that has a small play area for kids, but she soon came around, and was all smiles the rest of the day. The week was rather ordinary in every other way. Work has been busy. I have been extra tired of late--probably a side effect of getting up so early in the morning to exercise. A couple of nights I was asleep before my daughter. Challenge & Dare Update: I continue to make steady progress with COYER, and I have yet to stray from the TBR Triple Dog Dare. I have not read any books for the What's In A Name Challenge, but don't count me out. It's still early and I am sure I will start knocking those books off soon enough. As for FitReaders, I wish I could say my first week of attempting to get back in motion didn't quite go as planned. I managed to get two official 2-mile workouts in. I figure spending all day on my feet at Disneyland has to count for something too. I may not have walked fast, but I did do a lot of walking. It is a start. Hopefully this next week will go better. Tuesday - Where Is My Bookmark? Leaving the tree up sounds lovely. My grandmother left her Xmas tree up all the time. She had one of those silver ones with the multi-colored light, which she also used in the evenings. And I think I've read The Chosen One a few years ago. Don't remember much about it, but I must have liked it. Have a good week, Wendy! Kay - Thank you. It's definitely some much needed good news. While it isn't the ideal job (what is though, right? ), it is a job and that's what matters most at this point. The Chosen One does sound interesting. It's been awhile since I last read a book about a cult and polygamy, both subjects that intereset me, and so I'm looking forward to this one. I hope you have a good week too, Kay. What a nice week! Lego and Play-dough sundaes! Perfect! Oh, and books of course. I've never watched Dr. Who but I'm kind of wishing I did. I wouldn't know where to begin now. Have a great day. Debbie - It was a nice week. No disasters, rather quiet, and even some good news! Whew. Doctor Who is fun, even if a bit campy. If you do want to give the series a try, start with season one of the reboot with Chris Eccleston as the Doctor. You have to watch a few episodes and not just base it on one--because it is a bit different. If you decide to give it a go. :-) I hope you have a great day too! I haven't been doing well with #Fitreaders this week either. I'm going to change that today though :) Congrats on the good news- and what a wonderful way to celebrate with Disney! I was doing really good with choosing books from my January reading pile but I'm contemplating going off track for my next read. The Body Farm by Patricia Cornwell is just calling my name. LOL! Have a great week!! Samantha - Today sounds like a good day to get on the right track with #FitReaders. :-) We are relieved my husband will be working again. He starts training on the 25th. Hopefully it will go well. I say go with what is calling to you reading wise. I hope you enjoy The Body Farm! I hope you have a great week too. Hmm. The idea of curling up with a mug of hot cocoa and a book and a cat on my lap sounds heavenly. I'd have to borrow my cat niece as I don't own a cat (my rent would be a lot more expensive if I did). I'm glad your husband found a job. Definitely something to celebrate! Good luck with your fitness goals this week and I hope you enjoy your reading too. I like to vary my reads and I think a historical novel sounds perfect after reading thrillers. I've got Moonlight Over Paris on my TBR list. Thank you! Hopefully this next week will be better for me fitness wise. I hope you enjoy Moonlight Over Paris when you get to it! I am enjoying it so far. That Anne Bishop series sounds good, I have the first book, but haven't read it yet. We're currently watching star trek deep space 9, we have Firefly on our list of series to watch once as well. Congrats on your husband gettign a job and that's fun you got to spend the day at disney land. I am making some good progress for coyer too. Have a great week! Lola - It is such a good series! I read the first three books in the series last year and just loved them. I hope you are able to read it. Firefly is one of our favorite shows. I highly recommend it. Thank you! It hasn't been easy for him, but hopefully things will look up now with this new job. Yay for the job offer - I know that has to be a relief. I rather love your family tradition with the Christmas tree. I have a friend that leaves her tree up and decorates according to the calendar. Congrats on the job offer. Hope this week's fitness goals are a success. Have a great one. Nise' - We haven't made it with the tree up past March yet, but maybe this year. :-) Here's to a good week all around! Dark Matter sounds pretty cool, I loved Firefly so I might have to check this one out! Which season of Doctor Who are you on? I need to watch the new season with the twelfth doctor. I love that your Christmas tree is still up! Ours is too, haha! Congrats on your husband's job offer, Disneyland sounds like a perfect way to celebrate! Have a lovely week, Wendy! Cyn - I am dying to start Marked in Flesh. I just love that series. I still think Firefly is the better of the two shows, but we are enjoying Dark Matter. We've watched up to the 7th season of Doctor Who, but decided to start over and rewatch the previous seasons since we fell so behind. So now we're nearly done with season two again. Congratulations to your husband on his new job - that's terrific! Thank you--we're excited about his new job. It's considerably less pay and less vacation/sick time, but it's a job and that's what matters at this point. I feel so bad for all you've had to deal with. I'm thinking of you. Thank you. I'm very glad to see some good news this week -- yours, and some others'. It's a welcome light against this week's sadness. I'd love to do Disneyland, we are going to Disney World again in September, I do love that Mouse!!! As a fan of Firefly I will be checking out Dark Matter it sounds like my sort of show! Heather - Someday we'll make it to Disney World. I imagine it's much bigger than our little Disneyland in Anaheim. I hope you like Dark Matter if you give it a try! That's a cute idea to keep the tree up and decorate it for all different holidays! I'd have never thought of that. Glad you had a fun time at Disney too. Cool yet sunny is the BEST Disney weather! Kristen - I love days like this. :-) I imagine leaving our tree up is a bit lazy, but we had such fun last year making decorations for each holiday. I'm surprised my daughter remembers! Yes, cool and sunny is much better than hot and sunny when at the Park. The weather was so pleasant! I really loved both Angels Burning and What She Knew. One of my favorite Alan Rickman movies was an older one, with Kevin Kline, called The January Man. A mystery. One year I kept up my Christmas tree (a fake one) until March! Yes, a bit much. Thanks for visiting my blog, and enjoy your week. Laurel-Rain - I enjoyed them both too! Just trying to put together my thoughts about What She Knew into a coherent review. The longest we've kept our tree up was through March. My daughter had been so adamant last year we keep it up through her birthday. She enjoys it and so I don't see the harm. Stephanie - Thank you! It's definitely good news for us. I love Disneyland this time of year. A lot was closed down because of the new construction and the taking down of the holiday decorations, but there was still plenty to do. After the War is Over looks like a good read and of course, I can't wait to hear what you'll think of What She Knew! I am looking forward to reading After the War is Over. I'm quite enjoying Robson's Moonlight Over Paris at the moment. Congratulations on your husband's job! Yay! And Disney is the right way to celebrate. :) I didn't have much of a reading week either but I feel like I am finally caught up on everything that has been pending so maybe this week will be better. 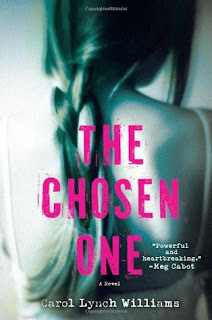 I listened to The Chosen One on audio a few years ago ... intense but so good! And I've got After the War is Over to get to sometime soon. I am glad to hear you enjoyed The Chosen One. I'm looking forward to reading it. I hope to get in some walking this afternoon. It didn't happen this morning, I'm afraid. Holidays always throw me off. Congrats to your hubby on the job offer! That is always exciting news!! I think our cats would love it we kept our Christmas Tree up all year they were really upset when we took it down! I am going to have to make space soon to read Written in Red since you and a lot of my blogger friends like it so much. I see you got the newest one in the series..need to start now before I get to far behind...lol. Enjoy your new reads! Stormi - It was one of my favorite reads last year. I hope you enjoy Written in Red if you do like it. I'm anxious to read the latest! Have a great week! We started watching Dark Matter too. It's pretty good. Yvonne - I am glad you are enjoying Dark Matter too! Enjoy your week! Sounds like a great Sunday! Glad you guys are enjoying Dark Matter, I liked it a lot. Looking forward to next season. Greg - My husband and I are hoping to find time to watch some more episodes soon. We saw the first episode of The Magicians which is available On Demand and liked it. It shows promise. As if we need more shows to watch. Woo hoo for the new job! As I've been reading through your posts I was thinking I was going to email you after to see what was happening. What a relief! As for the books. The Chosen One was a favorite of mine the year I read it, I think. Enjoy! Stacy - It is a relief. His schedule will be similar to his old one, which is nice. I am glad to hear you enjoyed The Chosen One so much--that's good news for me! It sounds like something I will like, and so I'm excited to read it. Those all look like great reads, especially the Anne Bishop one. Congrats on your husband's job offer. Spending time at Disneyland with the family is always fun. Have a great week! Grace - Thank you! It's back to normal this week. Enjoy your week! Congratulations with your husband’s new job. That must be such a relief. I love that you still have the Christmas tree up. I don’t think I’ve ever heard about someone who still has their tree up.. LOL!! Love that. Maureen - Thank you! Yes, it is quite the relief. I am glad he was finally able to find something. I would love to visit Amsterdam. It sounds like you had a lovely time! I hope you havea great week too! Oh yes, walking around Disneyland should count! I think that's the first time I've heard of a child not wanting to go to Disneyland, though I can understand it. And congratulations to your husband! I remember a few years ago hearing that the day Christmas decorations 'should' be left up until is February 2nd :) Hope you enjoy your new books; glad to see you've another Anne Bishop there. Charlie - We've gone so often to Disneyland this year to wring every penny out of our annual passes that I'm sure the Park has grown a bit common place for her. She does love it when she's there though. The parades, and rides, and cast of characters . . . Sounds like the perfect cozy Sunday. After the War is Over looks good. That's a cute tree tradition and congrats on your husbands job offer! Naida - Thank you! We've enjoyed a quiet weekend. :-) I love Jennifer Robson's books. Your new books look great, I really need to start Bishop's series - I see it everywhere. Lexxie - Yes, thank goodness for the test tasting doll! Haha Thank you. I hope he likes his new job as well. Enjoy your weekend! Congratulations to your husband! That is so fun you went to Disneyland to celebrate. I wish we lived closer because December was our first time there during a holiday. I loved the holiday decorations and the lights at night. I bought the first Anne Bishop book while it was on sale. I can't wait to read this. 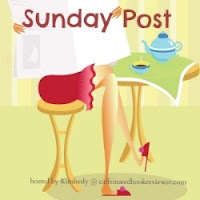 Thanks for stopping by my blog and I hope you have a great week! Kathy A - Thank you! It was my husband's idea to celebrate at Disneyland. :-) I love the Park during the Winter holidays! All those Christmas decorations . . . I hope you enjoy the Anne Bishop book! Enjoy your week! I think it's a fun idea to decorate your tree for other holidays! I put up a mini black tree with orange balls & lights for Halloween the past couple of years, and I'm thinking of upgrading to a bigger one in the fall. :-) Congrats to your hubby! Diana - We enjoyed doing it last year. It was a lot of fun making the ornaments for each holiday. I love your Halloween tree! I don't know if we'll keep it up that long, but it's an idea to consider. 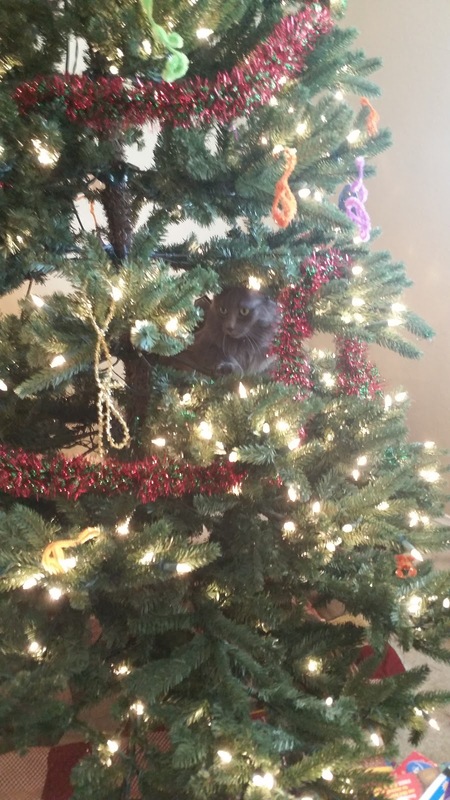 You kept your tree up last year past March? I can see why she's hoping for a repeat. Ti - It was up through my daughter's birthday at least--so it probably went down mid-March. I was actually surprised she remembered, but I probably shouldn't have been. She's got a good memory. We usually leave our Christmas tree up, but because George thinks he's an ornament, I took it down early (and George had a tantrum. I hadn't realized cats have tantrums). 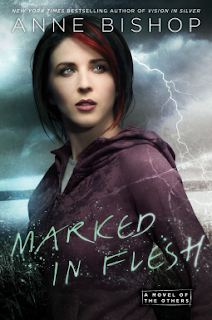 I'm glad you'll be reading Marked in the Flesh- I'm having a hard time getting a decently priced copy of Visions in Silver still, so I'll have to wait on that one. Congrats on your husband's job offer- that's great news! Congrats to your husband!! Everything should be celebrated by a trip to Disney. If only I lived closer, I probably would! Lol. The Anne Bishop series sounds really good!! I am going to have to put that on my list! I really enjoy Anne Bishops books. This is my second series by her, but I have a feeling I will eventually try all her books.